Icom’s M605 has received the NMEA Best VHF Radio Product Award for 2017 & 2018. 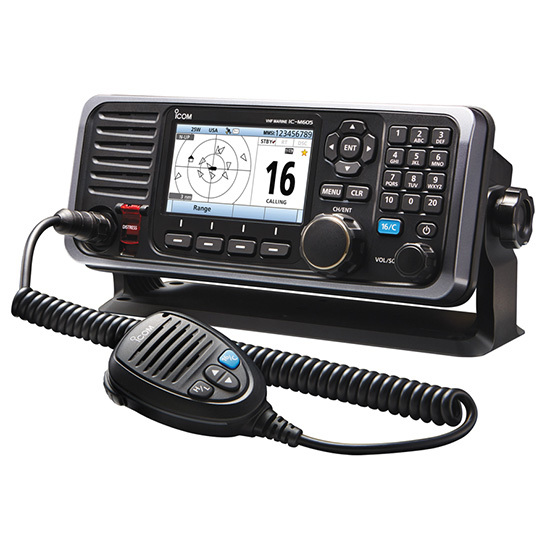 The M605 gives the user flexibility in setting up their radio system on their boat. Remotely control up to three controllers using all the M605 functions with the HM-195 series COMMANDMIC™ and/or the RC-M600 Command Head. Either option can be used as an intercom between the radio and the unit, as well. Bring on the color. The M605’s large 4.3" color TFT LCD display provides nearly a 180 degree viewing angle. The high resolution characters and function icons along with the directional keypad and soft keys provide an intuitive user interface. The night mode screen provides comfortable operation in the dark. Most used functions are assigned to soft keys (at the bottom of the display) for quick one push function access. The large ten-key pad enables users to smoothly enter channel numbers, MMSI numbers with ID names and much more. 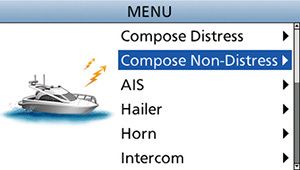 Using NMEA 2000™ connectivity, the radio can exchange GNSS, AIS reports, DSC call information data, radio frequency, and PGN list data on the network. NMEA 0183/-HS GNSS position data can also be converted to NMEA 2000™ data for other equipment. 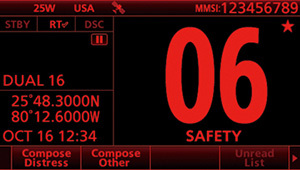 The M605 with the integrated AIS receiver can show AIS vessel traffic information on the display. 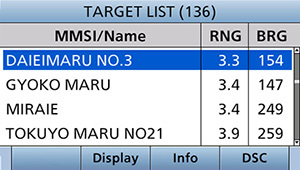 The AIS combo screen enables you to monitor the AIS plotter during basic operation. 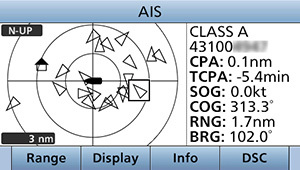 The M605 also allows the user to directly call a selected AIS target from the AIS screen using an individual DSC all.